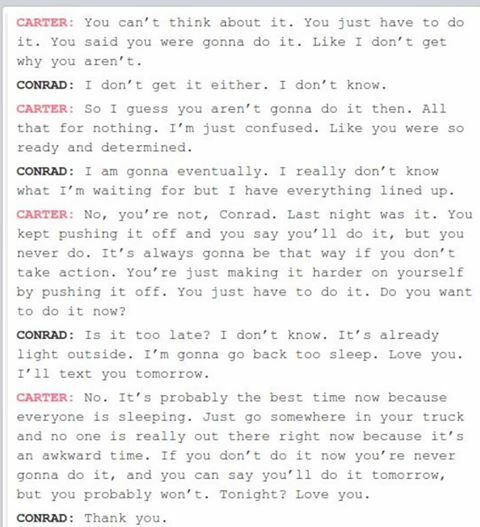 Some of the text messages from Michelle Carter to Conrad Roy urging him to commit suicide. Carter was convicted of involuntary manslaughter on Friday. The victim’s mother, Lynn Roy, says Carter has no conscience. ‘I don’t believe she has a conscience’: Heartbroken mother of teen who killed himself after being encouraged by his ex-girlfriend speaks out after she is convicted of manslaughter, on DailyMail.co.uk. In past years, I would have said “what kind of person does that?”. Now we all know. What a chilling horrific ordeal this poor young man was dealing with on his own. No doubt this evil evil evil sociopath planted the seed in his mind to kill himself & she was the one to tell him how he would kill himself. It’s nothing more then murder. The two blessing to come out of this nightmare for his family 1) this evil person left a trail of text messages of how she manipulated him to kill himself 2) the Judge found her guilty!! Thank goodness the Judge did not weaver. It makes you wonder how many victims of sociopath in this world had been pushed in this same manner by the sociopath that was in their life & the sociopath got away with the murderous act. It’s down right murder! RIP to this young man. Condolences to his family & friends. Hopefully she will get the max sentence of 20 years. Which still is not enough, it should be life as well all know she will keep doing these evil acts not only in prison but when she gets out of prison. this young woman deserves the legal punishment she got; you dont yell ‘fire’ in a crowded room. she had every chance to speak up, get help and not be a party to his death. Sadly, what the media are writing about is the legal precedent this is setting, and what kind of effect it will have on free speech protections. Once again showing how our standards for civility and the promotion of a civilized culture take little account of those among us who do not play by civilized rules, and whose free speech can cause irreparable harm to individuals, groups, societies, nations, and the world. Almost no discussion, other than a one sentence mention that the prosecutors argued she was a narcissist, who had no concern for his welfare. I understand the pundits being concerned with free speech. I believe in free speech, mostly, I think (how is that for ambivalence?). There has been a lot of talk about it lately. Hate speech is part of free speech. But it is really hard to support free speech, and it’s legal protections, over the ability to prosecute and sentence someone if that speech results in harm. I don’t think this decision should mean we have to worry that all of us are not free to say what we want, even if other’s don’t like it, or it hurts or frustrates them. You are free to say what you want, disordered or not. But aren’t you responsible for the effect of your speech? To what degree? This has certainly opened a can of worms, and it will be interesting to see if the conviction is upheld.